So were you as disappointed with the Super Bowl commercials as we were? When a company is paying more than $100,000 per second for an ad, a huge investment in making a good impression, you would think the standards would be pretty high. Just as it was the lowest-scoring Super Bowl game in history, you could say the same thing for the ads. Where were the creativity, the connections, the joy that make ads memorable? There was precious little of that. Now, Dux is not an advertising shop, and our experience in creating and placing ads is limited. But what we look for is advertising that connects, that differentiates the advertiser from its competitors and creates or reinforces a positive feeling about the advertiser. The message is key in public relations, because that’s what you want people to remember about you, and advertising really isn’t that different. 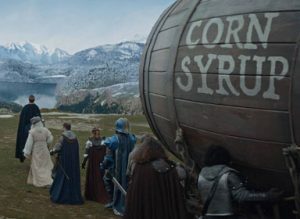 The Bud Light corn syrup ads. They had a light, funny feel to them, and most importantly, it was easy to remember who the ad was for and how it differentiated them from competitors. The second one, in the Trojan horse, played off the first one successfully. Hyundai’s elevator ad. By treating traditional car shopping as one of the lowest levels of, basically, hell – beyond root canals and vegan dinner parties – it was clear by contrast that the elevator was finally ascending to the apparently heavenly experience of car shopping with Hyundai. The downside: Hyundai triggered a wave of social media vegan anger, and then caved with an apology. Maybe the dentists will come after them next. The NFL/Super Bowl ads with Peyton Manning starring in the opener and a slew of famous former NFL players in the second ad. Both spots were fun and entertaining, and Peyton Manning is someone who refuses to take himself too seriously, which is always refreshing. The robot-related ads were generally creepy, and just prove the point that it takes humans (or dogs!) to create a connection in an ad. Doritos needs to crowdsource its creativity once again, because the year they did that, they got some great ads. Celebrity cameos are fun (even celebrity cars!) even when the ads they’re in aren’t all that special. And speaking of dogs, we had hopes once we saw the Budweiser Clydesdales and the Dalmatian, but ended up a bit disappointed. Yet the Budweiser ad did showcase one key point. While my reaction to their message that all their beer-making power is wind-generated was “so what,” there are an awful lot of millennials – the key demographic now for beer ads, to build brand loyalty while they’re young – that do care about that sort of thing. Many in that generation want the companies they patronize to be socially responsible. So that could be a winner, even though it wasn’t the kind of heart-tugging ad that Budweiser has been known for in the past. We’ll hope for better performances next year, and while we’re at it, maybe the Patriots could take a break for a year from the Super Bowl? Just to give somebody else (you hear that, Cowboys?) a chance.